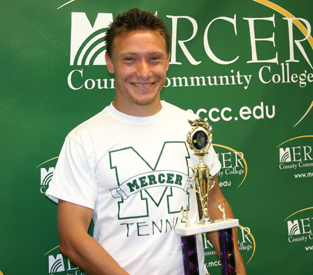 Marc Nichols has found his direction - and earned a national title in tennis - during his highly productive time at Mercer County Community College. His victory at no. 1 singles in the NJCAA Div. III Tennis Tournament in Plano, TX, on May 15 marks the first time ever that a Mercer tennis player has reached the pinnacle of the sport. With a season record of 19-1, Nichols has no regrets, noting that his one loss earlier in the season came against Ross Armstrong of Montgomery College in Rockville, Md., the player he ended up facing in the semifinal round at the nationals. "In the big picture, the loss actually helped," Nichols said. "I knew I would meet up with him again at the nationals and that he would be my biggest hurdle. That loss gave me the motivation to win." Going into the tournament unseeded, he had a tough road to the final. In the quarterfinal match, he faced the no. 3 seed from Rock Valley, a player he beat handily 6-3, 6-1. As Nichols predicted, the semifinal contest against Armstrong proved to be the true test. After losing the first set 6-1, he took a brief break to mentally regroup. Nichols' coach, MCCC's Marc Vecchiolla, counseled him to outplay his opponent, not overpower him. "Coach Vecchiolla said I should mix it up," Nichols recalls. "Instead of pounding the ball, I should slice and spin." The second set was a completely different story as Nichols started getting more of his first serves in and rallies went to 30 strokes or more. The second set lasted 100 minutes. "It was my hardest 6-1 victory ever," he said. Nichols recalls a sweet moment after winning that set. Looking up at the hill next to the court, he saw that he had company - lots of it. "Players from every team were watching. People were cheering for each point. It's a high; it's what you look for. And I remember thinking, 'I've got this match.'" After a rain delay, the scoring process changed to a 10-point system, with Nichols taking the set 10-4. He remembers a particularly grueling rally. "I was in a dead-on run and nailed my forehand. It was my best point ever and sent Armstrong's racquet spinning. The hill erupted. At 8-4, I felt like we were done." The final proved a breeze, as Nichols easily defeated Haris Redzematovic from Kingsborough Community College (NY) 6-2, 6-1. He had seen a little of his opponent's semifinal match. "I knew he was good - he had an amazing forehand - but I didn't see him mixing it up," Nichols said. "I was really nervous when I started and was down 2-0 in the first set. But I had a game plan. I used speed and my slice and I hunted down every ball. I won the next six games. Every game was hard fought." The first set lasted 35 minutes, but by the second set, Nichols' opponent had given up and it was all over in 10 minutes. Vecchiolla, who has coached many successful women's teams at Mercer since he started in 1997, completes his first year as head coach for men's tennis. "I've never had a national champ at #1 singles before," he notes. "I'm so proud of Marc. I knew he had the talent and power and ability to play defense. He is fast and fit. He kept varying his strokes and outlasted his opponents mentally and physically." Nichols admits that when he came to Mercer two years ago, he wasn't focused - either on academics or tennis. After taking a year off, he returned to campus in the fall of 2007 with definite goals - and he met every one. "I had goals not only on the tennis court, but in the classroom," he said. 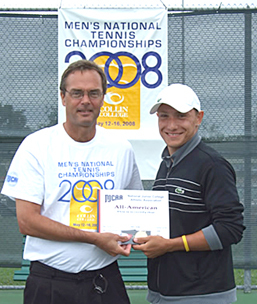 Originally majoring in computer science, he is now set on being a teacher and coaching tennis at the college level. He plans to transfer to a four-year school to continue his education. Nichols gives Mercer and his coaches a lot of credit. "I have tons of gratitude to Mercer for making this possible for me," he said. "Stan Dlugosz (Nichols' first coach, who retired in 2007) did a lot to get me eligible two years ago. When Coach Vecchiolla approached me to play this year, it sounded like good idea. He saw my potential as a player and a person. The assistant coaches also encouraged me to be a leader, to be in it not just for myself, but for the team." Tennis is proving to be just the lift he needed. Nichols finds that it is opening doors academically. With two years of eligibility left, there are scholarship opportunities. "I give Mercer credit for helping me build my self-confidence. I never had focus. Now I have learned to concentrate on both academics and athletics. I have the drive and ambition to go on."